Charity shop and car boot sale shopping ruin you a bit for proper shops. It's like being in a foreign and very expensive country when I accidentally wander into John Lewis these days. The exception can be some of the ridiculously discounted high street sales that they have nowadays, as well as outlets of course. Charity shop finds. All modern, no vintage this time. 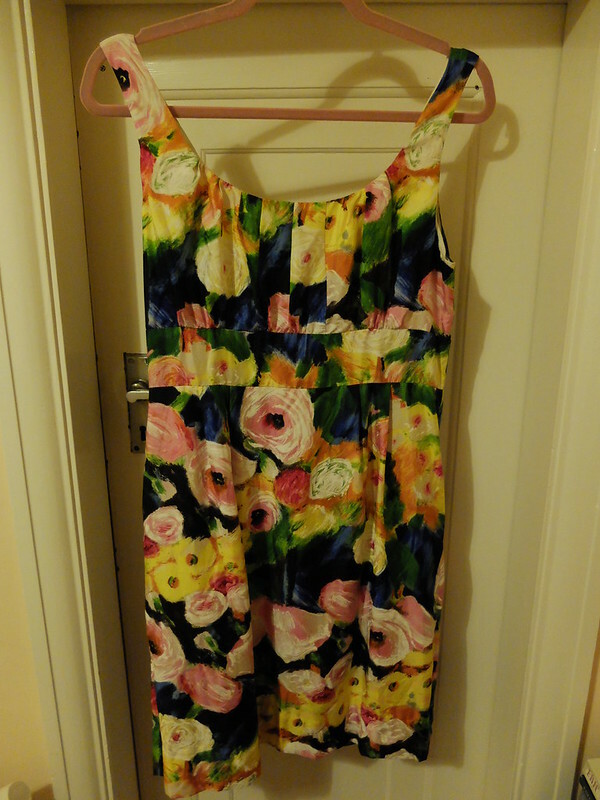 J Crew silk dress, £2. Not my usual choice of colours and I'm not keen on florals, but it's silk, it was cheap, and it fits perfectly, so it might be a holiday dress contender. Not worn it yet. 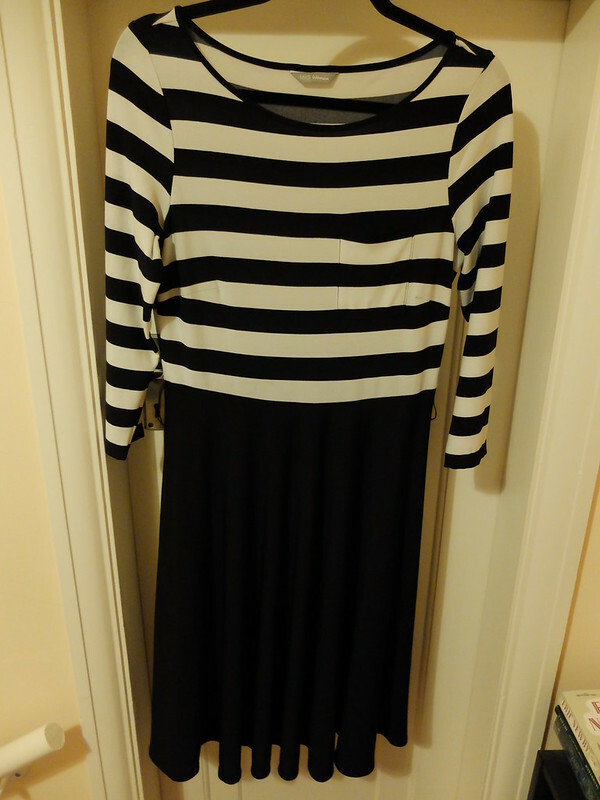 M&S stripe dress, £2. Not stepping out of my comfort zone with this one as I already have several striped tops and black skirts that I could use to create this look with! A bit of déjà vu. Worn this once, needs a non-static slip underneath because with tights it's a nightmare at riding up! Asda jumper dress, £1. 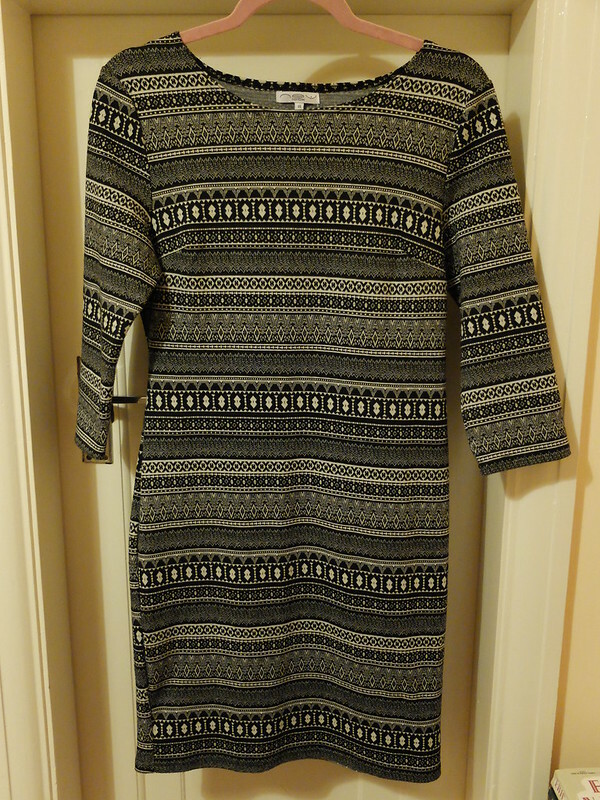 Another one of those stretchy jumper dresses that I favour to wear at home with leggings, to be comfy and dressed down in. Worn a few times. Next outlet purchases. I spent a total of £54 on the following 7 dresses. Short white dress. I wore this on New Year's Eve and fell in love with it. I'd envisaged it as a work dress but teamed with gold accessories it proved that it glammed up nicely for evening. Worn once. 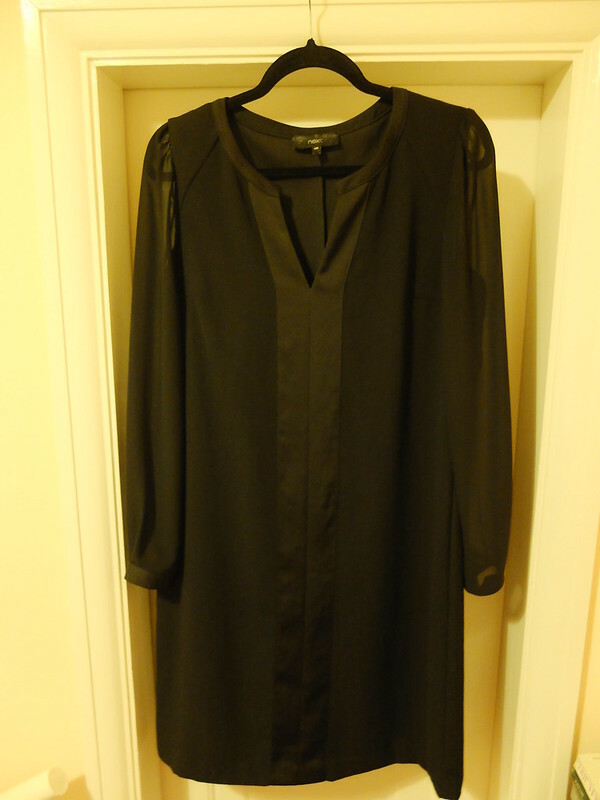 Black sheer sleeve tunic dress. I think Claudia Winkleman wears this kind of dress! Worn two or three times. 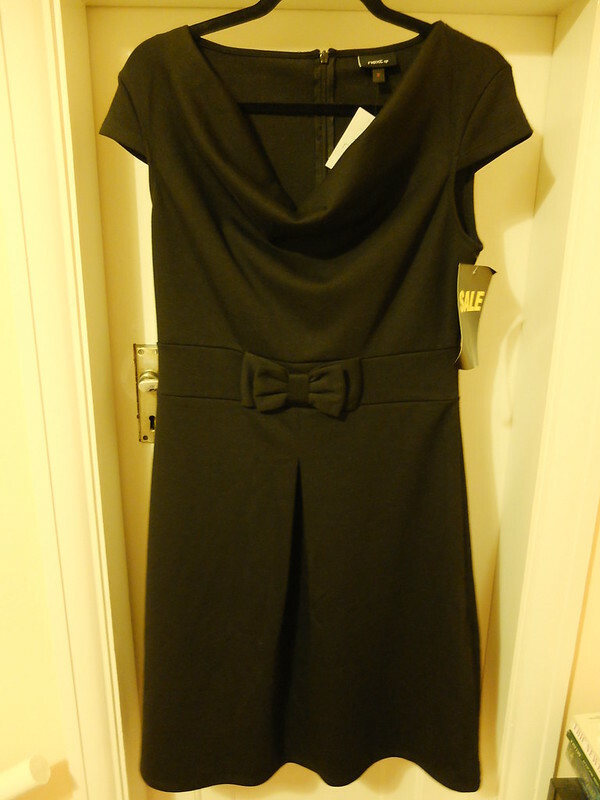 Black bow dress. I thought this could do for work, or maybe lunch whilst on a European city break in the Spring. Unworn. 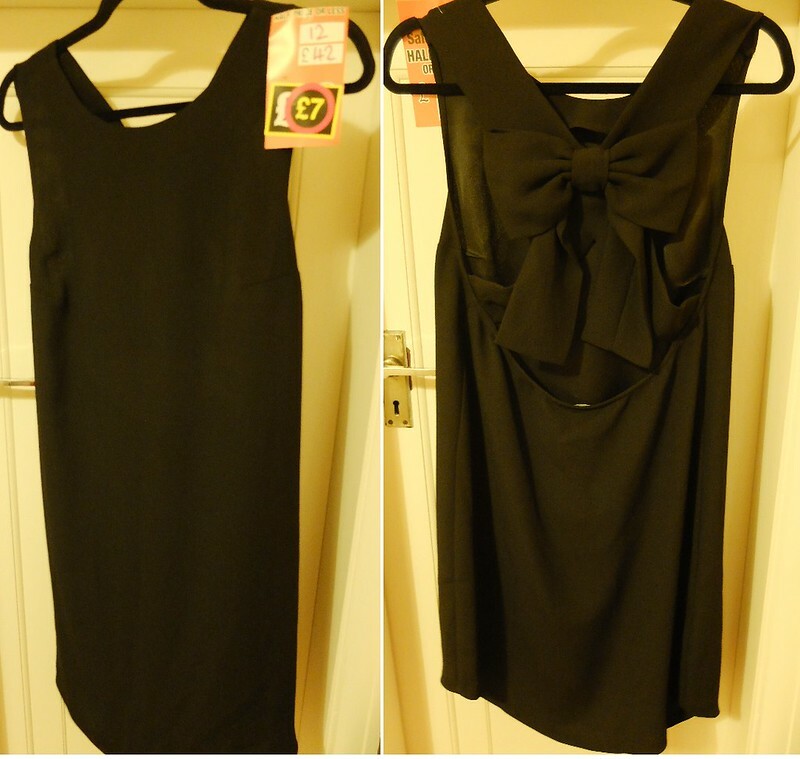 Black bow back dress. 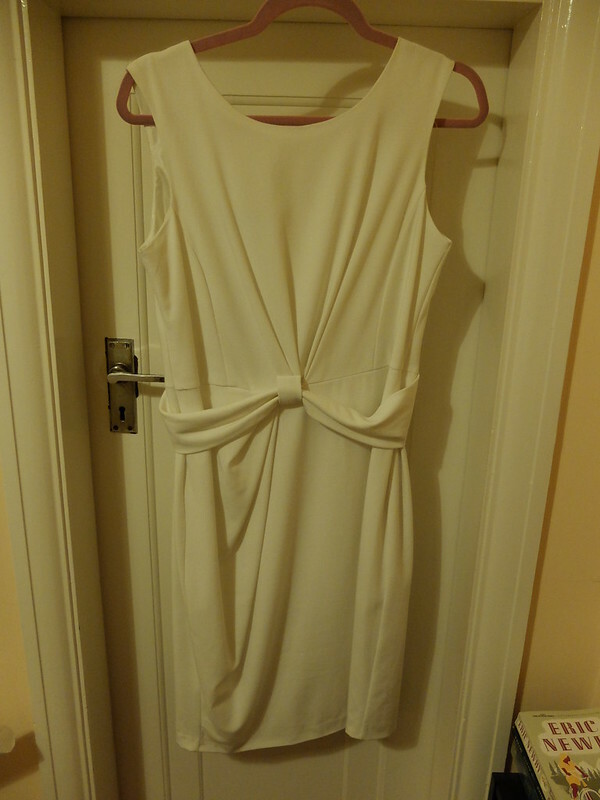 I love dresses that are unassuming from the front, and then you turn around and bam, there's the sexiness. Unworn. Grey floaty dress. 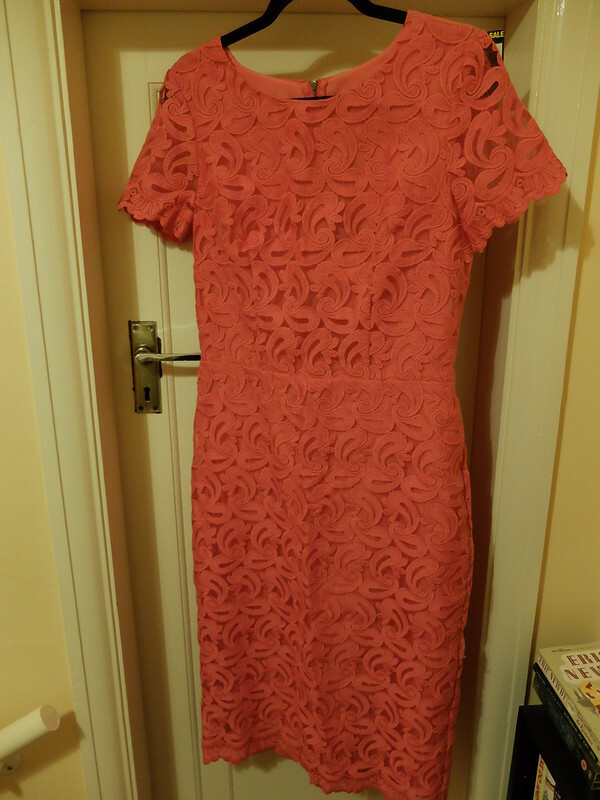 This was the most expensive dress (£12) and the one I was least sure of. It said 'Alexa Chung' to me. At home I tried it with a belt and it was instantly improved, so I'm keeping it. Unworn. Coral mid length dress. The best thing about this dress is that it was from the tall section, so hits me perfectly mid-calf. I could see this as a wedding guest outfit. Unworn. 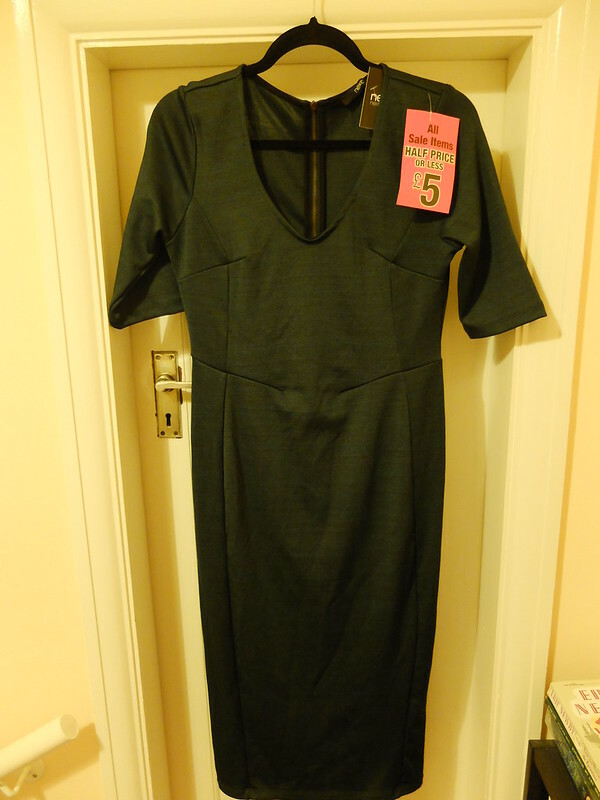 Green midi dress, £5. Another one for the office, you can't go wrong with this kind of dress, and again it hits me mid calf. Worn a few times to work. Perfect. 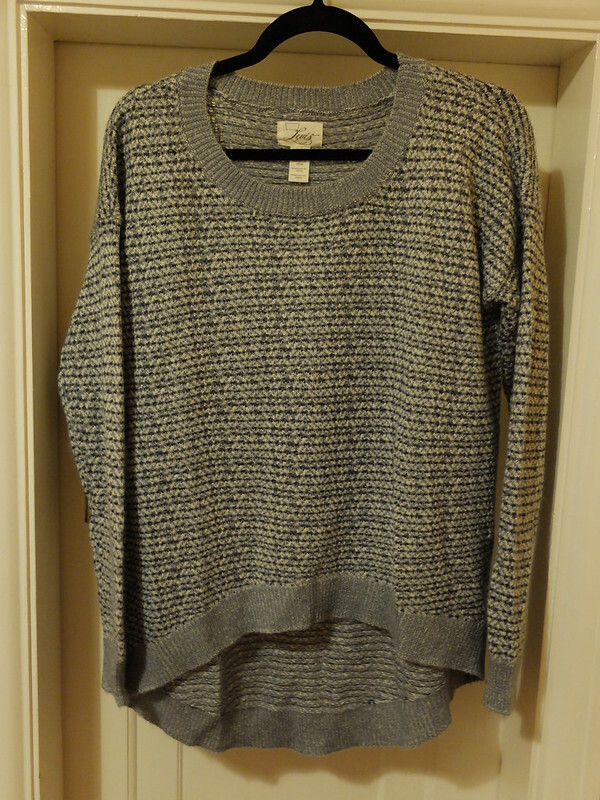 From the Levi's outlet, wool jumper, £17. The other half hates this so I partly bought it in defiance. It will do as a warm but thin layer for country walks. Have been living in it around the house! 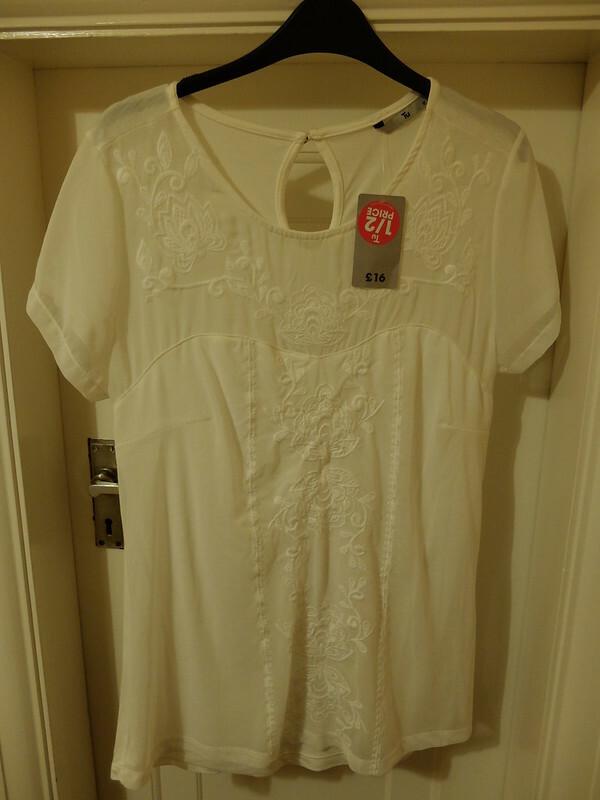 From Sainsbury's, top, £8. One to stash away for summer. Unworn. 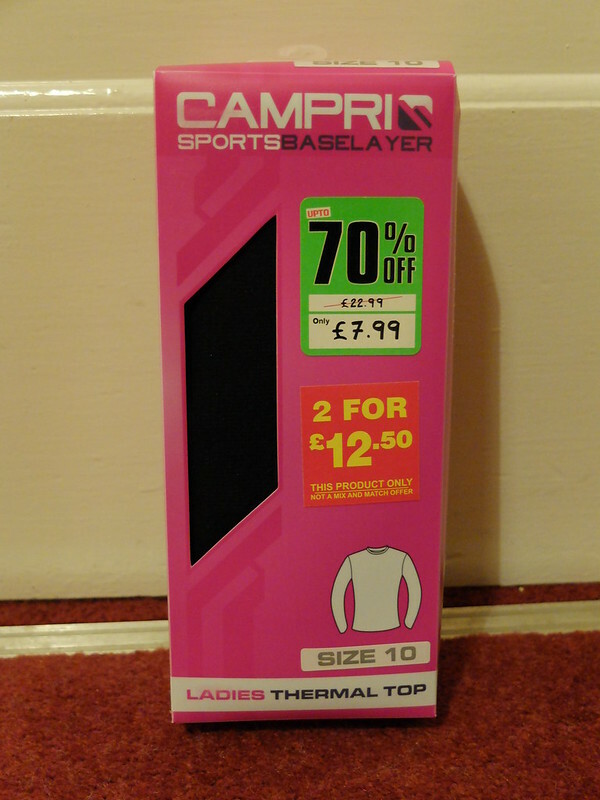 From Sports Direct outlet, two baselayer tops, £12.50 for two. Essential for yoga in a chilly sports centre. Worn lots, they're really good at helping me stay toasty. 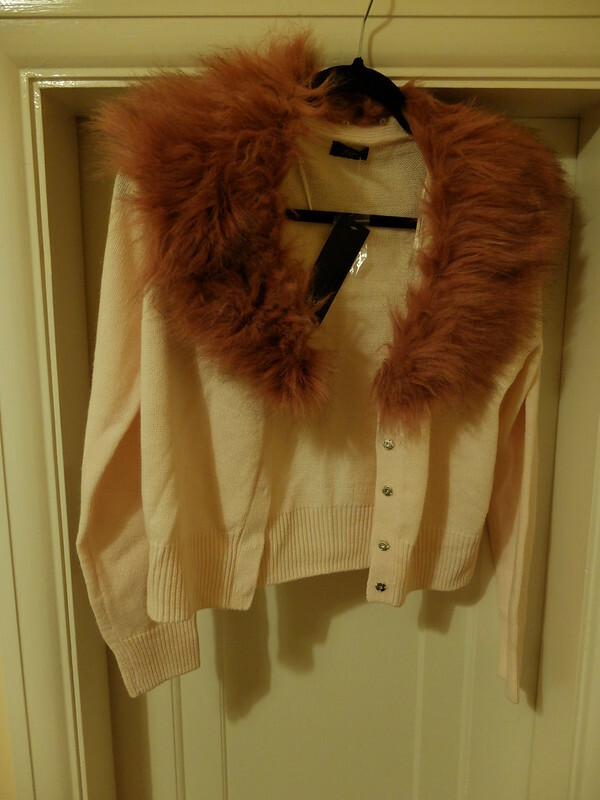 Faux fur trim cardigan, Tesco, £10. 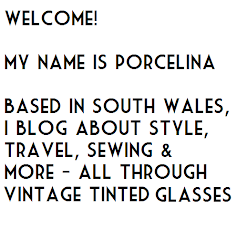 This was utterly frivolous, but I love it! Unworn. 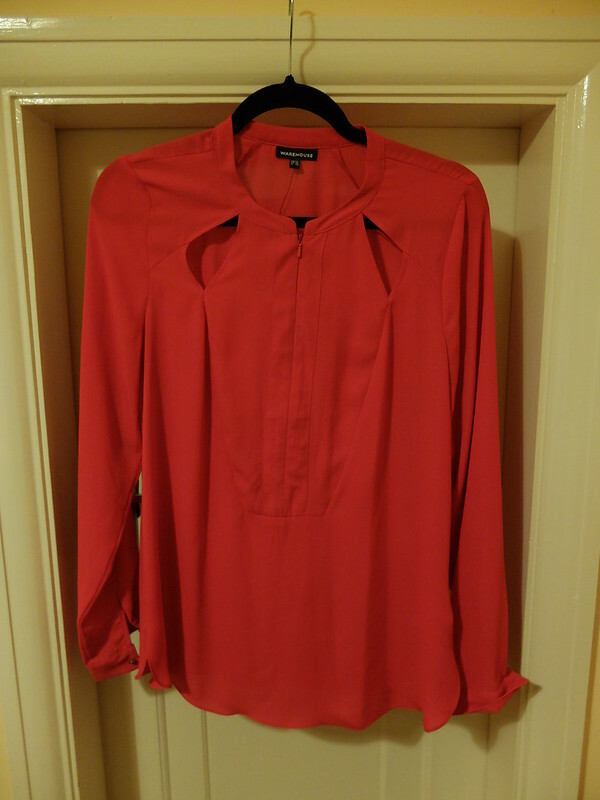 I had a lovely Warehouse top as a Christmas present, but it didn't fit, so I exchanged it at Debenhams and also used up some of a gift voucher, returning with a pair of black trousers, £10, and a red blouse, £15. 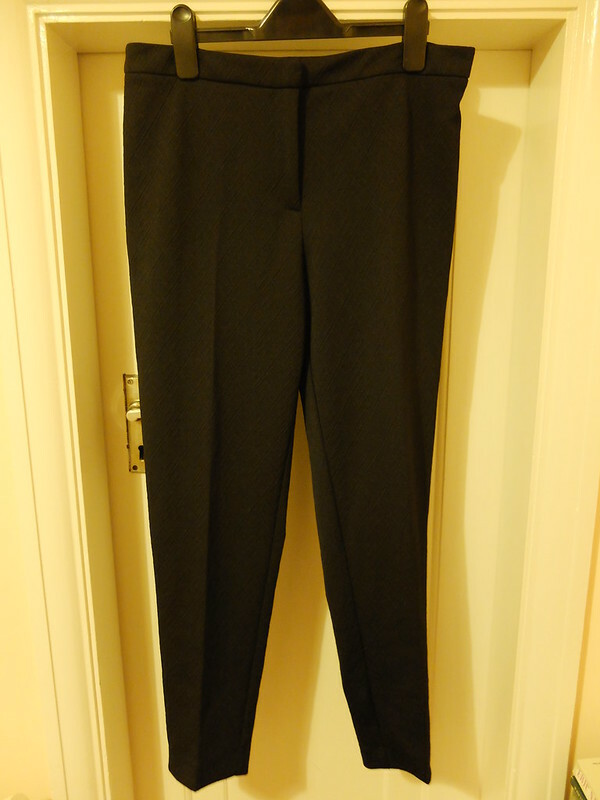 It's incredibly rare for me to find a pair of high-street trousers that actually fit. These aren't perfect, but they're close. 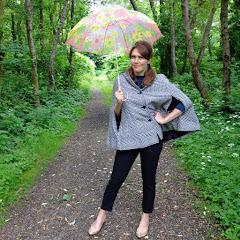 The secret is the stretch, the absence of pockets, the sensible 'rise' and the cropped length. The blouse drapes beautifully even though the other half says the front of it looks like a horse. Neither have been worn yet. That's a total spend of £105, plus some of a gift voucher, which won't break the bank but was enough of a splurge to be exciting and it gave me a little boost to face January with. Oh, and February and March, and some of April, because I'm only on day 44 of the 100 day spending ban. Thursday 9th April seems a long way away, the day I am officially allowed to shop again. But let's be honest that there are quite a few items in my purchases above that I haven't worn yet, so I really can't complain. I'm also setting myself another target of getting rid of 100 items (not just clothes) as a bit of a decluttering challenge. As the flow into my wardrobe is temporarily stemmed it might be the perfect time to cull the unworn and the unflattering. I've already taken 7 pairs of shoes to the charity shop, along with 5 cookbooks, and a bag of around 20 VHS tapes. Have you hit the sales this year? Or have you been sensible and stayed away from the shops? Are you avoiding shopping for a time or having a declutter?? My, that is quite the haul! I like the fur trim cardi. 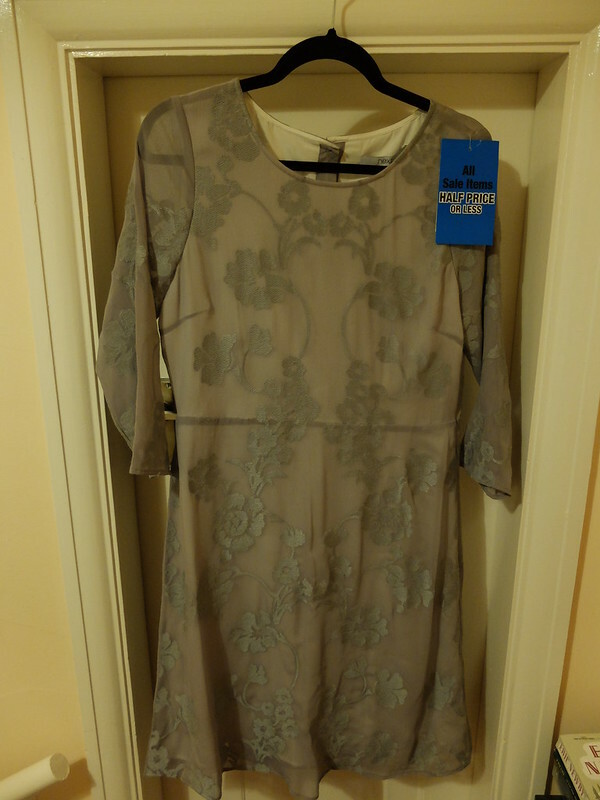 I bought a new dress on January sale, but other than that I haven't spent money. I originally thought I wouldn't shop any clothes on January, but then I saw -20% sale on Vivien of Holloway and decided to grab the dress I'd been yearning for. Not a big discount, but still better than full price. I love that striped dress and the first black dress, they're really cute :) I might shop quite often, but I wear everything I buy at least once, usually more than that. I need to get rid of some clothes I don't wear anymore and maybe cut on shopping at least until it's spring and all new pretty spring/summer collections arrive. I'm honestly not sure I could manage a 100 day no shopping thing I have nothing but admiration. I like your thinking of a good pre-ban sales shop to see you through though! Yes! I did the same thing. Gotta have a little something to tide you through those long days of no shopping, right? I'm really impressed by your finds - not even in a "for the price" kind of way, just impressed, full stop. That J Crew dress is gorgeous and will look beautiful on you, and those pants are quite the find. I see the horse, though, not gonna lie. My other half will be reassured deeply about the horse's head!! Oo you did some sneaky pre-banx shopping too? Whatcha get? So many dresses! Yes, you can work your way through those and not feel the pinch of a shopping ban for a good while! I can imagine you looking beautiful in all of them. Wow, that's a lot of clothes! Shopping on the high street does my head in nowadays. The quality of the fabric in so many places is so poor, I really struggled to spend some Debenhams vouchers in the sale. I should go shopping with you, you find ace things! Decluttering. I ought to do that, but can't! Awesome haul! I know exactly what you mean about thrift store (and wayyyyy back in the day, often online vintage shopping, too, but sadly that ship has long since sailed) prices "ruining" you for modern stores. I'm the same way, too, with few exceptions in the fashion, decor and furniture front (and to a lesser degree, because I don't buy as many second hand ones as I used to in my earlier days, books as well). 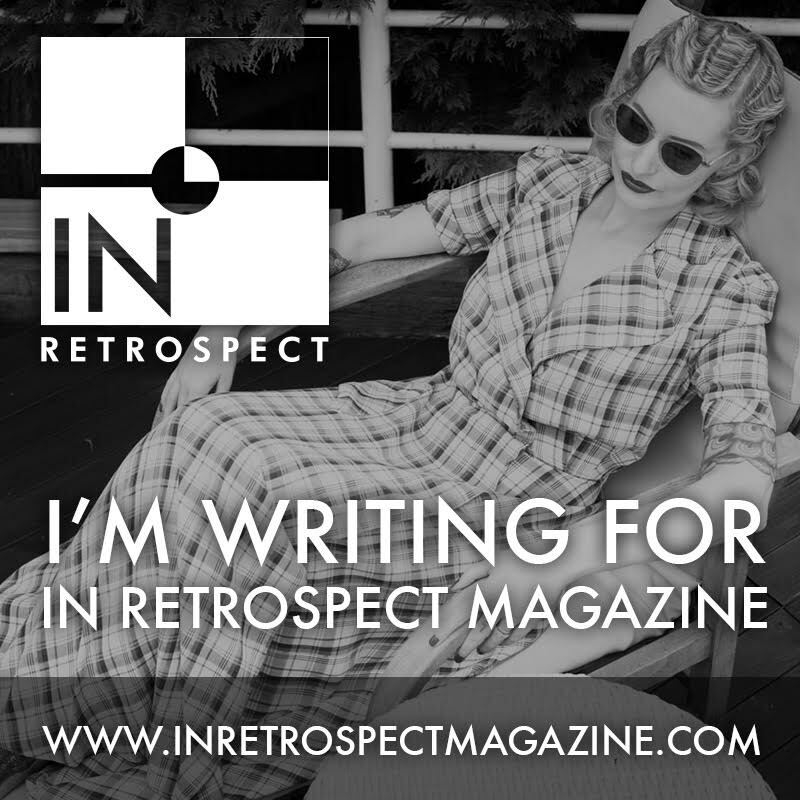 I can't help but think that this must ring true for a fair number of us, especially those on tight budgets, in the vintage loving world. No wonder you aren't shopping for 100 days, that's a lot of clobber!